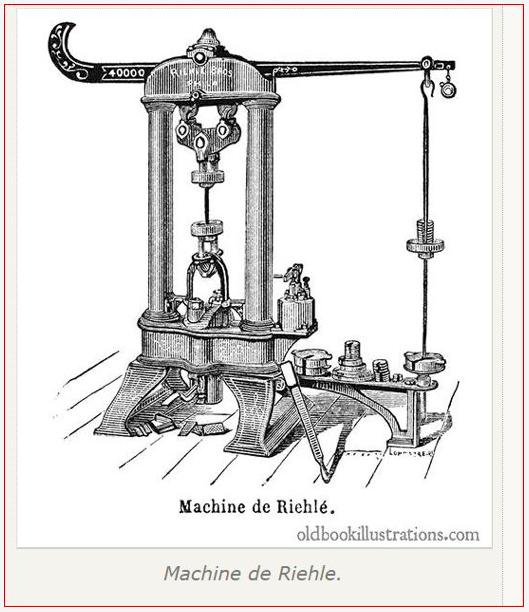 Also Known as Riehle Brothers Manufacturing and Riehle Cold Bend Co. 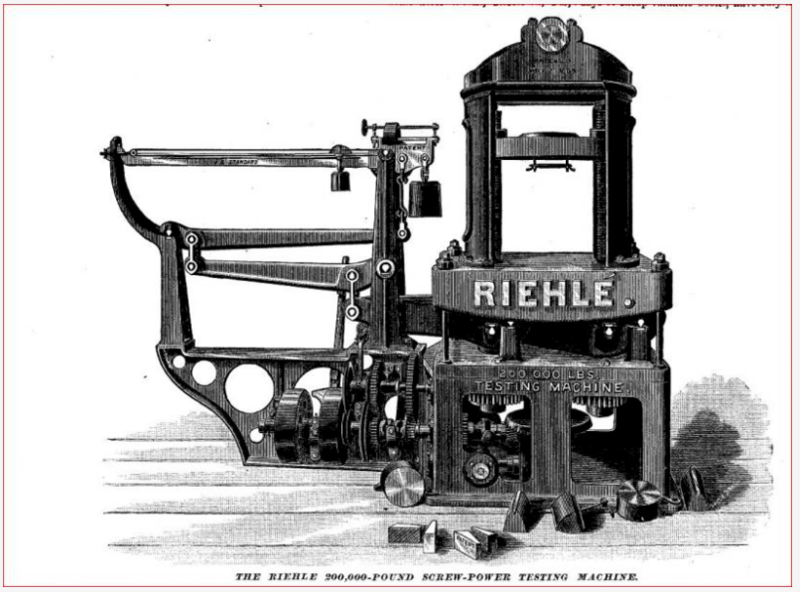 The Riehle Universal Testing Machine at the Smithsonian Institute was manufactured in 1893 by Riehle Brothers Machine Company of Philadelphia. Apparently this company was also known in the industry as Riehle Cold Bend Co. as they did tensile testing, or the bending of steel until breaking in order to test its strength. Such a device is commonly referred to as a universal test machine or UTM. In 1865 Frederick A. Riehlé along with other family members purchased a minority share of Banks, Dinmore & Co. along with its portfolio of patented designs, including a range of scales of various sizes and a line of machinery for testing materials such as iron bars, railroad rails, and concrete. Soon after, Frederick convinced his partners to acquire the assets of Abbott & Co., also a manufacturer of scales, which was in financial difficulty as a result of poor management. In 1867, Frederick and his brother Henry bought out the other investors and changed the name to Riehlé Brothers. Shortly after Henry’s death in 1890 a competitor paid a large sum of money for Riehlé Brothers’ scale business, allowing Frederick to focus on the testing products. In 1903 he incorporated as Riehlé Bros. Testing Machine Co. Although the brothers were in the material testing business as early as 1865, a Norwegian-born American engineer and inventor named Tinius Olsen (1845 – 1932) is sometimes credited with the invention of the UTM. Olsen immigrated to the United States in 1869 and began working as a designer for William Sellers & Co. By 1872 he was employed by Riehlé Brothers as the firm’s superintendent and was the principal designer of Riehl’s testing machines during the 1870s. By the end of the decade friction was developing between Olson and the brothers and he was terminated in December of 1879. 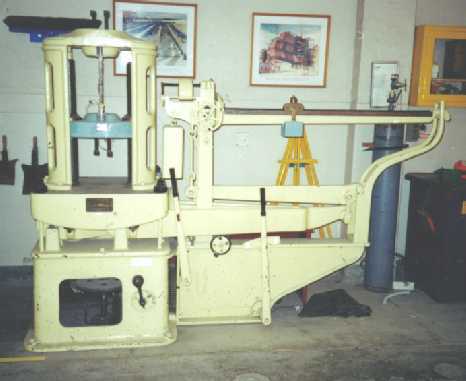 In 1880, Olsen patented a machine of his own design and started the Tinius Olsen Testing Machine Company to produce the device. 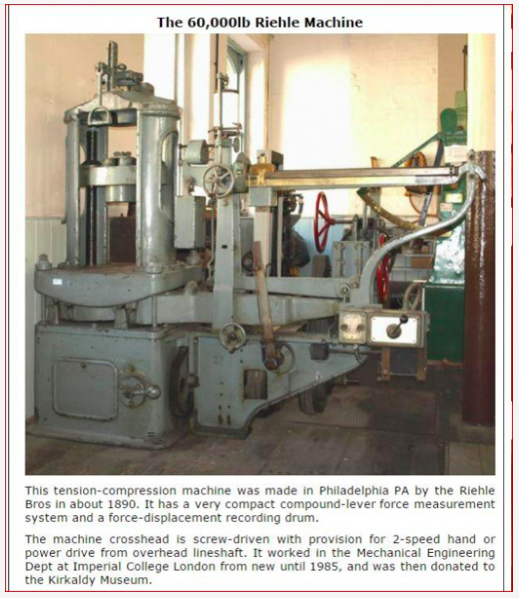 Also located in Philadelphia, the companies competed into the twentieth century with both companies continuing to develop new testing technology. A visitors to Riehle.Net told us that, according to sources at Cornell University, Frederick wrote a paper, “Fifty Years of a Businessman’s Life” in 1916. 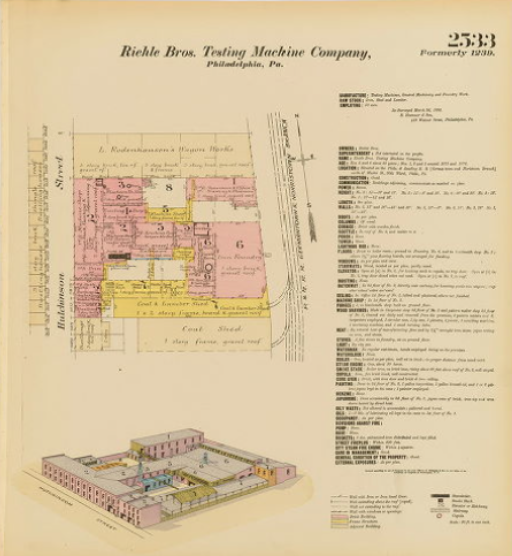 There is also reported to be a paper on Riehle Bros. written in Philadelphia entitled, “The Company ” (1927). While we have not been able to locate the latter, “Fifty Years of a Businessman’s Life” is available from Google as a download at no charge. Philadelphia and Today’s Foundrymen: Philadelphia, the American city with the strongest historical relation to Germany, was first settled to become the center of the textile industry, especially in the district of Germantown. Later it became a metropolis of the iron, steel, and metals industry. Here the world’s first foundry technical association was established in 1891, and here Frederick A. Riehle of Riehle Bros. Testing Machine Co. was instrumental in laying the groundwork for the American Foundrymen’s Association (AFA). Henry apparently was a Union soldier in the Civil War, after which he married Clara Watson, daughter of Johannes Watson of Philadelphia who owned or managed an iron chest and safe manufacturing company in Philadelphia and likely was a social acquaintance of the Riehles. Henry and Clara apparently had at least one child, a son named Otto. Unfortunately we have little additional information about the family. We received this photograph from a gentleman with the Forest Research Institute in India. 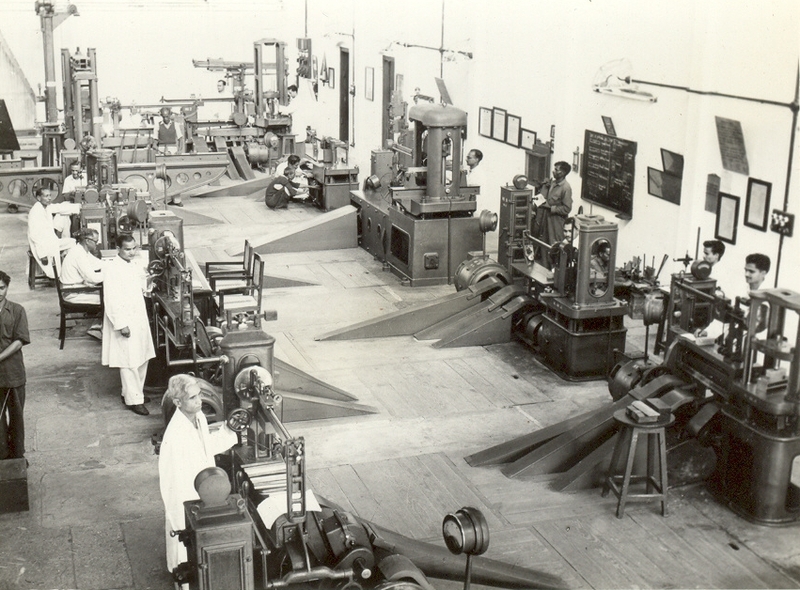 The Institute has several Riehle test machines which were installed in the 1920s. We get emails from time to time with folks looking for information on the company and about its history subsequent to its heyday at the turn of the twentieth century. Unfortunately we have virtually no information regarding such history. We find evidence of continued operation at least through 1920 but have not yet discovered any details about the company subsequent to that. We would appreciate hearing from anyone who has any information about the company after that date. Even more, we would very much like to get more information about these brothers and their ancestry as at this point we do not even have the names of their parents, let alone the Immigrant Ancestors. In fact, we are anxious to connect with any of the old Pennsylvania and New Jersey Riehle families who are virtually unrepresented on Riehle.Net. Please reply below! Sources: Much of this was sourced from various Internet pages including the ones mentioned and linked above but especially Vintagemachinery.org.